I’m a huge Emily Giffin fan and have read all her books. I just absolutely love her writing style. It’s easy, free-flowing, conversational and well, honest, unpretentious and forthcoming. She transcends conventional literature, making her characters relatable where the lead heroine reveals the deeper part of herself in such an honest, assured way that reminds us we’re ‘not alone’, we are all humanely flawed, and in so being, share company in whatever ‘issues’ we’ve faced. 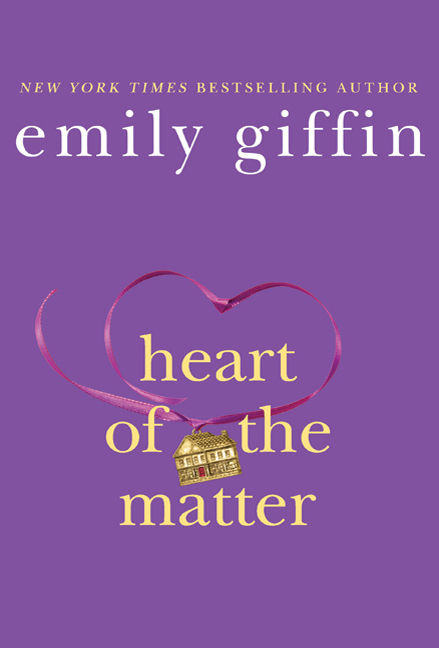 Whatever the dilemma, Emily Giffin’s characters have been there too, and they’re more than happy to take you on a tour of every bitter emotion, happiness and fear that only make them all the more intriguing. More importantly, I finally got to meet her on May 13 in New York at the New York Look. The interesting thing is that when you finally meet Emily, you feel you already know her. And if you’ve spoken to anyone standing in line, you’ll find that many of her readers feel similarly connected to her and speak of her as if she’s a friend. She’s adjoined herself to her readership in such a way as to amass a huge following. Yes, I was one of the first people there, waiting, (I bought a nice pair of earrings showcased in the glass window – hey, I was early), then later had a glass of wine with my husband at a little bistro across the street until the hour of her arrival– when all her fans started excitedly piling up outside the door. When she finally stepped in, she sauntered through, energetic, smiling, eager to see her fans, in a pretty dress fitting to her petite frame, camera in hand, and snapping photos of her long line of readers. That’s a first! But that’s Emily reaching out and connecting with her fans. Up close, sitting beside her on the couch where each reader was invited to have his or her book signed, she’s sweet, pretty and disarming. On a glass table in front of the couch are custom-made miniature pink and blue pins, scattered about and filling a glass vase with SOBO and ‘eg’ printed on them, celebrating Emily and the movie that is currently in production. I point to my husband, sitting across from us on another chair, and we both turn to look into the lens to smile as he snaps our photo. And you don’t want to leave the moment while you’re in it. But alas, you must, to make room for the next reader in line who, like you, travelled just as far to see her. 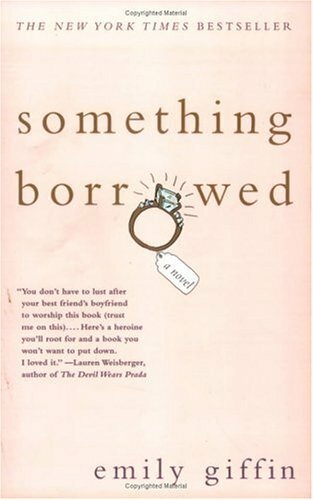 Readers have often compared Something Borrowed with every other book in the genre that has followed in its wake. It was a fun, refreshing read, addressing infidelity from a unique, sympathetic and at relative points, comical reference. Each character evoked some kind of emotional response from you, and you found yourself talking and venting about Darcy, Rachel, and let’s not forget Claire, as if they were real people part of our inner circle. If you’ve read this book, opinions ran pretty deep; you discussed these women as if you knew them personally and shared the same alma mater with them. I often found myself thinking about their situation years after reading the story. Well, get ready to make room for another novel that will spin you in a whole new direction, but will find itself setting the standard once more. This time, the tone has changed from her other novels, Giffin competently proving again her ability to foray into new territories of fiction and story-telling the very flaws that trademark her stories and the characters who inhabit them into being so utterly relatable. In Heart of the Matter, she tackles infidelity once again, but from a perspective told more soberly and in alternating points of views; the wife and ‘the other woman’, allowing readers for the first time ever to obtain a thorough, if even reluctant understanding for both grievances. Each finds herself facing disheartening circumstances that merge and radically abort their lives in a way that neither ever expected. Tess and her pediatric-surgeon husband Dr. Nick Russo are celebrating their seventh wedding anniversary when he is paged to the hospital unexpectedly, cutting the evening and the celebration short for husband and wife. The call is in response to an incident regarding a six-year old burn victim named Charlie. While caring for him through Charlie’s process in healing in rounds of surgery and skin grafts, Nick eventually becomes emotionally attached to Charlie’s mother, Valerie; a single mother, hard-working lawyer, who’s been raising Charlie on her own. Abandoned by the biological father of her son so many years back, cut off by her friends over a minor disagreement, and feeling somewhat isolated from the snob society of her son’s peers, Valerie has been dealing with loneliness far too long, and Nick, over stepping the boundaries of his oath as a doctor, allows himself to get a little too close to mother and son. And Valerie, worried sick over her son’s unfathomable misfortune that no child should ever endure, becomes emotionally and faithfully dependent on her doctor’s ability as healer. His presence in their life is a stark reminder for the void of both father and spouse that Valerie and Charlie are understandably aching to fill. But is our empathy so great that it’s at the cost of a greater sacrifice from another family? Here enters the complexity of omniscience when we see all sides. Tessa, against her mother’s advice, walked away from her career to commit herself as a stay-at-home mother for her two children, is now having serious doubts. Unaware of Nick’s growing attachment to Valerie, she now feels a distance growing between herself and her husband, and doesn’t know what to ascribe it to. The book is deep, serious, and at unexpected moments, heart wrenching as we find ourselves sympathising with the plight of both women, rooting that a resolution can be found for everyone involved without more suffering going any further than need be. Heart of the Matter bravely approaches the uncomfortable territory of forgiveness, the consequence that a choice or a chance meeting can irrevocably put into effect. We also are reunited with Rachel and Dex, Giffin’s way of bringing both reader and vintage character together in a casual reunion, allowing us to get a glimpse of where they are today long after the final page of Something Borrowed was closed. So where does this leave Tessa after the sacrifice is made? And an unforseen consequence that is un-rewarding follows? Whatever choice Tessa makes in the end, in reaction to this dilemma, I’m with her. This is the first time I’ve read a novel where I found myself suspending judgement, where no one earns the rank as villain and where objectivity takes a front seat to emotion; or maybe it shares the same place, since empathy allows this to be so. I support Tessa in whatever decision she makes. Feel for both women in their plight. In which case we come to learn that sometimes there is no right and wrong, situations aren’t always absolute (particularly with infidelity), and that forgiveness isn’t just a choice but a process we have to work through. But above all, that the best choice we can make is the one we can live at peace with. I strongly recommend this book to both new readers and veterans of Giffin’s books alike. 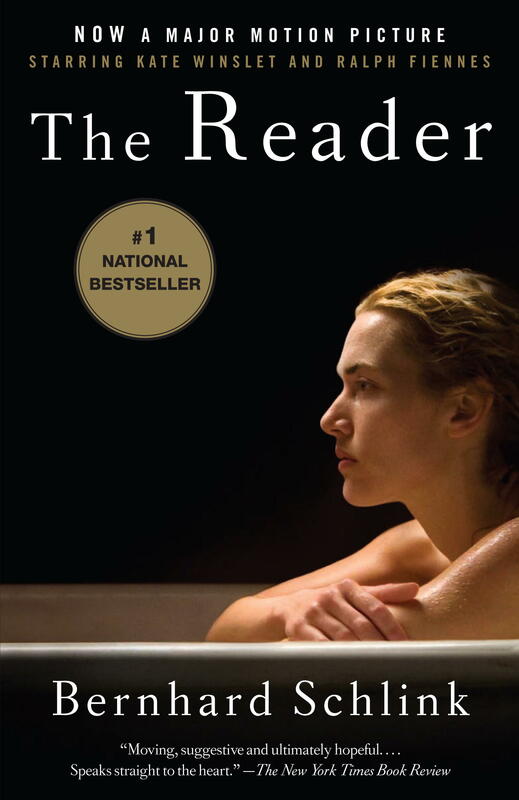 Tantalizer; Having won the Boston Book Review‘s Fisk Fiction Prize, and having heard from so many people who’ve either seen the movie or read the book, The Reader was a novella that was well worth stocking in my library. An author whose name I wanted to add to my list. In post World War II Germany, a chance encounter entwines the lives of a young boy and a grown woman, both of whom are separated by a new generation of Germany and the Nazi Third Reich. Fifteen year old Michael Berg is walking home from school one day, when, in a period of failing health, falls ill until a stranger (a bosom blonde named Hanna Schmitz) comes to his rescue and helps him in his weakening moment, even walking him back to his apartment safely. Michael, under his mother’s urging, returns to her apartment once he is feeling well and brings her flowers. With no prior expectation otherwise, they develop a physical relationship, one punctuated with inexplicable mood swings and dark behaviors by Hanna that both baffles and frustrates Michael. Part of what bonds them in this relationship is that he reads to her. Even during their hikes, walks through the woods, he is the one in charge of translating the maps that take them through their journeys. Then one day, with no reason, she disappears from his life. Years later, Michael and Hanna meet, once again, under unique circumstances. This time, he is a law student and is enrolled in a course that is examining the Nazi war trials. To his surprise, Hanna is one of the accused on trial in her role as an SS camp guard, answering to the court on the cruelty inflicted on its prisoners. And though there is evidence that could absolve her, or at the very least, the extent of her involvement in these crimes, she refuses to speak up, believing that the truth is far more shameful than her perceived participation in the holocaust. Michael, unbeknownst to anyone else, is aware of what Hanna is deliberately keeping from the court, and faces the dilemma of whether or not to expose this if only to save her from a more severe sentence. Impressions; The story tests our unwavering committment to love those who’ve committed atrocities beyond our imaginings, and our willingness to continue to love them regardless. It also explores a new generation of Germany, examining and condemning their predecessors for either their actions, or, just as damning, their willingness to look the other way. One has to wonder, if the very same people who condemned the Third Reich Germany had lived in a time of its occurrence, if they would have followed suit as their ancestors. Tantalizer; The story opens with Rachel out on the town celebrating her thirtieth birthday with a group of friends; among them, her outgoing and popular best friend Darcy who actually threw the party (and is stealing the show already by dancing on the bar) and Darcy’s fiance Dex. Incidentally, Dex and Rachel had met years back in law school, having been friends for quite some time before Rachel eventually introduced him to Darcy. Towards the end of the evening after everyone’s departed and in what seems to be an open invite to coincidence, Darcy, after having had one too many drinks, makes an early departure in a cab ride to head back home. Thereby leaving Rachel and Dex alone in the bar to talk over a few more drinks, and steal some time together to catch up as old friends. They share a cab ride home, and, hitting a pothole that throws Rachel on Dex’s side of the car, literally and in his arms, opens the floodgates in what becomes an illicit love affair. I was originally outraged at the very concept, but as the story develops, we learn a few things that seem to weave sympathy in Rachel’s favor. It’s told from Rachel’s point of view (the passive aggressive good girl who always tries to do the right thing and play by the rules). The very rules that, Rachel is now learning, doesn’t always get you ahead in today’s world. We discover that Rachel and Darcy have been friends since childhood. And that Rachel, deep down, resents Darcy. Soon, we come to see why: Darcy is the popular girl, with perfectly proportioned features of beauty that few can surpass. This pretty much allows her to have any guy wants, (or, ‘ahem’, steal any man she desires) and be the object that every woman wants to be friends with, every employer wants to hire. Basically, a life with the red carpet rolled out for her passage. With her combination of beauty, outgoing personality and favorable fortune, every opportunity falls in her lap. Rachel, meanwhile, is the ever so-reliable friend, working in a law firm that she despises. And who, despite her compounding resentment towards Darcy, strangely feels still protective of the friend she’s known (and looked out for like a sister) long since her early childhood. During the course of the story, we’re not only shown Darcy’s selfishness, but we also come to realize how unfulfilled Rachel is in her own life, exasperated even more as she measures herself against Darcy. Meanwhile, the affair between she and Dex thickens. With Rachel having the implicit understanding that what they have will end as the wedding date draws near in September, she begins to ask herself some very hard questions. Questions that deal with her claiming her own happiness, and the sacrifices she must make for it happen. Impressions; Soon to be made into a movie with Kate Hudson and Ginnifer Goodwin, to be released in 2011, I can’t wait to see this brought to life on the big screen. I’ve been keeping an eye on the casting for the last several months, and am fairly pleased with how they rounded it out. Colin Egglesfield was chosen as Dex, running very similar to what I’d imagine him to look like. One of the reasons why I love this story is that it gives the good girl a shot at happiness. It makes the circumstance work beautifully in her favor, allowing the mistakes and selfish behavior committed by Darcy to finally catch up with her. In no way am I here to condemn Darcy, or to condone what Rachel did, but Darcy was so self-absorbed, she behaved in a way that showed little regard for other people’s feelings. And it was interesting to see Karma work its magic in this unique tale. You just don’t always get to see scenarios play out this way in real life. Another psychological part at what worked in this story, I feel, is that it taps into almost a primal envy that so many people possess. Yes, Darcy was selfish, and her beauty seemed to give her the boldness to stake her claim on anything she wanted. Why not? It’s not like no one ever rejected her. Guys even dumped their girlfriends (one story depicted by Rachel) to be with her. But at one point, Rachel explains how, as they searched for Darcy’s wedding gown so many months back, they had such a difficult time finding the perfect dress. Why? Because Darcy, having the body of a runway model, looked good in EVERYTHING. No dress was off-limits for her. Enough to spark envy in any female friend. Did I mention in my “About Me” page that I love books that are confessional? Well, this qualifies as one of them. In this first-person narration, it’s easy to relate to Rachel’s dilemma.